Established in 2007, House of Blues is the city's hottest live music venue that also showcases many options for special events. With 6 private rooms and the ability to accommodate groups from 25-2500 guests, it's the perfect place to host corporate and private events, meetings, lunches, dinners, concerts and much more. From the state-of-the-art technology in the Music Hall to the exclusivity of the VIP club, Foundation Room, House of Blues provides the best in Southern-style cuisine, eclectic décor and live entertainment. 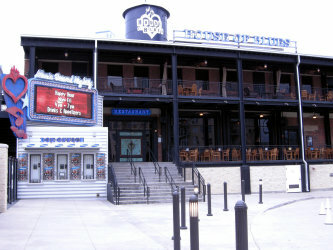 House of Blues Dallas opened in 2007 in the historic White Swan Building at the crossroads of Dallas' West End and the newly established Victory Park development. Home to unique pieces of art such as Alan Sainte James Boudrot's "A Dream Come True", this unique and history-rich building continues to celebrate and showcase art and music. In keeping with tradition, HOB Dallas displays the "Crazy Quilt" and keeps a metal box of mud from the Delta Mississippi under its stage. Whether you're looking to top last year's event or wow a whole new audience, we've assembled a team of experts in the fields of corporate entertainment, event design and cutting-edge technology to help you design a truly unique event. With over 40 collective years of experience in event planning, the team at HOB Dallas is top-notch. While many of our clients include our existing décor as one of the reasons they select our venue, we can also assist you in creating just about any theme event you can dream of with unique entertainment and special décor. Our talent buyers are the best in the country and can satisfy any musical taste from classic Blues to the latest Rock craze to the hippest DJs. And, our passion for the South guided the creation of our delicious southern-inspired menu with a variety of dishes from Cajun & Creoles to Texas BBQ to the finest in Dallas dining. Whatever you have in mind, our team is dedicated to designing an exciting event that is perfect for your needs.